How Would You Rate the Quality of Netflix Streaming Movies? David writes, "Wondering what your experience with the NXE Netflix streaming was like? I have a Pioneer Kuro 60" display. One of the best on the market. I have Time-Warner broadband with around 8-9000 Kbps down hooked up to my XBox. I tried the Xbox streaming this morning and the video looks horrible. Particularly in peoples faces. It's completely off color and basically unwatchable. Wondering if it's just me." How would you rate the quality of Netflix streaming movies? What title(s), TV, Internet service provider, and Netflix ready streaming device (Roku, Xbox, LG BD300, computer, etc.) are you using? PC Magazine Rates the Roku Player as a "Do Buy"
Do Buy: Roku Netflix Player This $99 set-top box will open up your living room to a whole library of video content and is way cheaper than a new Blu-ray player. The current Netflix on-demand selections are, admittedly, limited, but there are many great movies, with a decent number of newish ones in the mix. Plus, I expect that Netflix will eventually open up first-run films to this service. 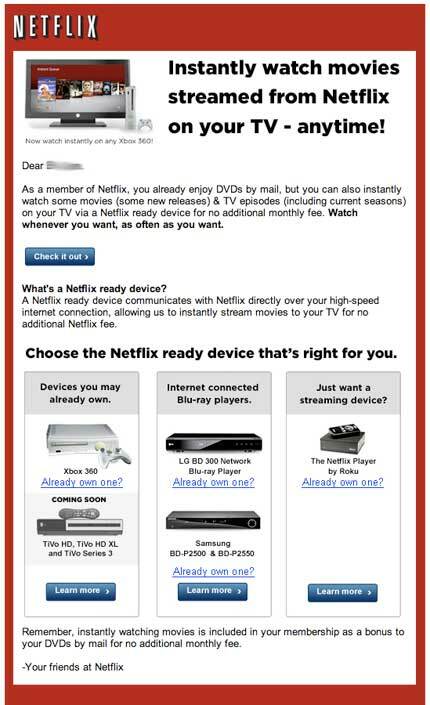 Caveat: If you already own an Xbox 360, you'll be able to access the very same library of Netflix movies on demand. (One can only hope Sony will get around to adding Netflix functionality to the PS3.) In that case, maybe you just give yourself the gift of a Netflix account. Video Business reports that Redbox is starting to rent Blu-ray titles. Redbox, the largest U.S. movie-rental kiosk operator, will include Blu-ray titles in machines at "select locations in a limited number of markets nationwide," said Gary Lancina, VP of marketing at Redbox, who declined to specify how many machines will have Blu-ray discs or the size of Redbox's Blu-ray inventory. Redbox will charge $1 for a daily rental fee, the same price as standard-definition disc rentals. The Criterion Collection has launched a new online viewing feature, and while the number of films is limited, the $5 rental fee can be applied towards the purchase of the DVD or Blu-ray version of the movie. Blockbuster has just launched the Blockbuster ONDEMAND service featuring the 2Wire MediaPoint digital media player, a set-top box that enables customers to rent movies and watch them on a television. In an interesting marketing move, Blockbuster is giving the MediaPoint away for free if customers pre-purchase 25 rentals for $99 (plus S&H). 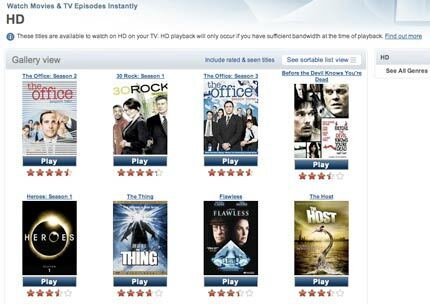 Rentals cost $1.99 to $3.99, and the ONDEMAND service offers "thousands of titles" including new releases. There are no monthly fees, but once a title is rented it must be viewed within 30 days, and watched within 24 hours of starting the movie. How does the 2Wire MediaPoint compare to Roku's Netflix Player? Blockbuster's ONDEMAND service uses a rental model vs. Netflix's subscription model. The MediaPoint supports HD content, while Roku has promised HD support soon. MediaPoint will offer new releases, while the Roku box has a limited number of new releases. Both boxes claim DVD quality, and as soon as I can test the two boxes I'll post a comparison. The MediaPoint is a closed system, while Roku has said they will be adding additional content providers. Netflix streams content to the Roku Player, while the MediaPoint uses progressive downloading. The Roku and MediaPoint both support WIFI and ethernet connections. Both boxes offer compsite, component, HDMI and Toslink connections. Blockbuster's MediaPoint digital media player will ship in time for the holiday season. Click here for the full list of new releases this week (88). Interesting titles include Hancock, Fred Claus, Meet Dave, 24: Redemption, River Queen, Beautiful Ohio, A Colbert Christmas: The Greatest Gift of All, Santa and Pete, Still Life, George Carlin: It's Bad for Ya, Spce Chimps, The Nutty Professor 2: Facing the Fear, and Elton John: Tantrums and Tiaras. Netflix To Announce 15,000 Streaming Titles Soon? At the start of 2008, the Web-streamed movie experience still felt like a half-baked preview of its potential. Digital delivery required expensive hardware, and you paid extra for each rental (cough, Apple TV... cough... Vudu). It wasn't the future we'd hoped for. 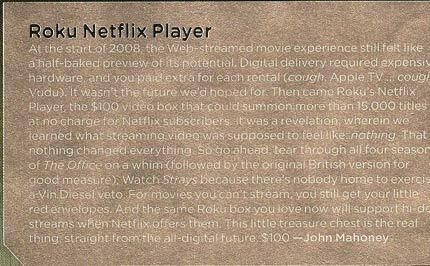 Then came Roku's Netflix Player, the $100 video box that could summon more than 15,000 titles at no charge for Netflix subscribers. It was a revelation, wherein we learned what streaming video was supposed to feel like: nothing. Hmm... Typo or a guess by Netflix at how many titles they would have available by the time the December issue of Wired hit the streets? The NY Times took a look at Netflix's Cinematch algorithm and the Netflix Prize contest, If You Liked This, Sure to Love That. The article is an interesting look at the competitors and the science of computerized recommendations. Cinematch has, in fact, become a video-store roboclerk: its suggestions now drive a surprising 60 percent of Netflix’s rentals. It also often steers a customer’s attention away from big-grossing hits toward smaller, independent movies. Traditional video stores depend on hits; just-out-of-the-theaters blockbusters account for 80 percent of what they rent. At Netflix, by contrast, 70 percent of what it sends out is from the backlist — older movies or small, independent ones. A good recommendation system, in other words, does not merely help people find new stuff. As Netflix has discovered, it also spurs them to consume more stuff. For Netflix, this is doubly important. Customers pay a flat monthly rate, generally $16.99 (although cheaper plans are available), to check out as many movies as they want. The problem with this business model is that new members often have a couple of dozen movies in mind that they want to see, but after that they’re not sure what to check out next, and their requests slow. And a customer paying $17 a month for only one movie every month or two is at risk of canceling his subscription; the plan makes financial sense, from a user’s point of view, only if you rent a lot of movies. (My wife and I once quit Netflix for precisely this reason.) Every time Hastings increases the quality of Cinematch even slightly, it keeps his customers active. Netflix has created a new HD genre page that is only available if you have a HD-enabled streaming device activated on your account, such as an Xbox 360. The genre only lists about 140 titles so far, and the Netflix Blog says there are about 300 titles. The Netflix blog also notes, "For now they will play with standard definition audio and we will eventually add multi-channel audio." Thanks to Darin, NetflixFan, and Anonymous for this tip.